Ben Hope, who grew up in Cahaba Heights, has performed on Broadway in the award-winning musical “Once.” Journal photo by Emily Williams. The production will be at the Virginia Samford Theatre Jan. 26 to Feb. 12. Hope is starring in the show, performing the role of Johnny Cash, as well as co-directing with his wife, Katie Barton. Both felt that the show’s family-friendly depiction of the country music legend’s life would appeal to a Birmingham audience. Hope, who grew up in Cahaba Heights, said he has been pleased to see the growth and prog- ress Birmingham has experienced. 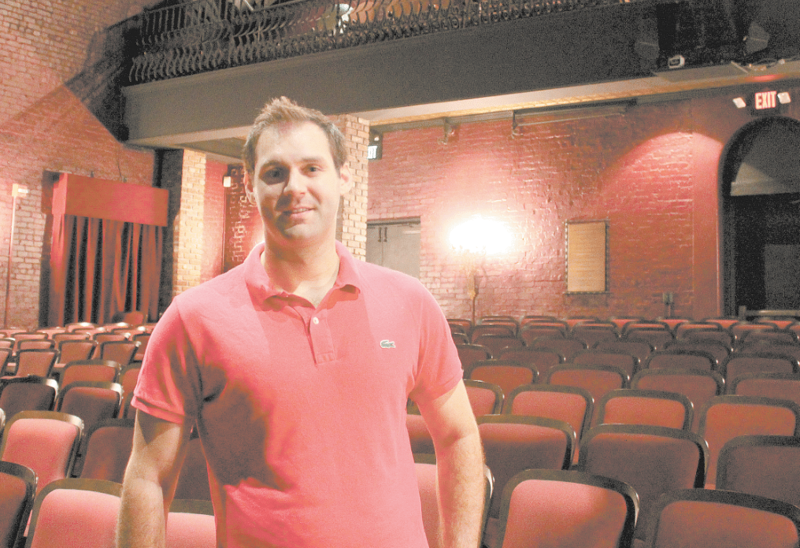 He recalls spending the summer of 1998 in the Summerfest musical theater program, a program that has grown into The Red Mountain Theatre Company. Hope has always had a love of music. His father is a musician and when his brother started to play guitar, Hope began teaching himself. After a “life-changing” experience in Summerfest gave him a new appreciation for musical theater, Hope learned the ins and outs of the theater during his time attending Shades Valley High School, studying under Roy Hudson. Hope said that Hudson, now artistic director of the Birmingham Children’s Theatre, was one of his biggest influences. He prides Hudson on his ability to show his students that a successful career in theater is achievable. After his collegiate studies, Hope moved to New York on a whim. His contract job in Orlando was about to end and one of his friends had a spare room open in his NYC apartment, so Hope took a leap of faith and moved. Before landing his big break performing on Broadway in the award-winning musical “Once,” Hope did a little bit of everything. His favorite gig was playing guitar in the subway. “I love playing in the subway. I still do. When we had a break during ‘Once,’ I would grab my guitar and go down there,” he said. Playing music in the subway earned him about $30 on a decent day, but what really paid off was the reactions of passersby. “I play a lot of classic country, like Hank Williams and some Johnny Cash,” he said. The classics seem to create a sense of nostalgia for passersby, some even stopping to tell Hope that he’d played their father’s favorite song or one they hadn’t heard in years. Everything about his journey to landing a role in “Once” was kismet, according to Hope. “I felt like everything I had ever done was leading up to that point,” he said. He auditioned for the role before it went to Broadway, watching it develop before his eyes as he went through more than six weeks of auditions. When he got the call telling him he had the role, he dropped his phone and broke it. Luckily, he had gone for post-call back drinks, and a fellow auditioner who also had been given a job relayed to Hope that he had made it. Hope identifies good country music as anything made before the early 90s, with possibly one or two exceptions. Audiences should expect a celebration of Cash’s music as Hope seeks to be a vessel for Cash’s story rather than trying to perform a Johnny Cash impersonation. The show is rated G, so Hope said it is perfect for fans both young and old. Young kids are some of his favorite audience members. Any way you spin it, with the help of his wife, whom Hope says has carried him through the directing process, Hope is ready to bring a show back home to the community that fostered his love of music.